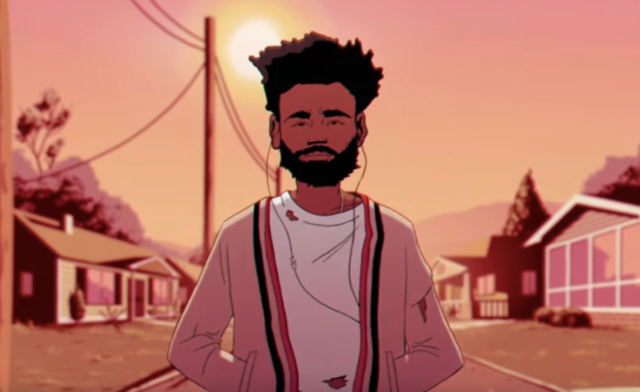 Childish Gambino has released a new animated music video for his song “Feels Like Summer,” which arrived this July as part of his Summer Pack release on streaming services. Co-directed by Donald Glover alongside Ivan Dixon and Greg Sharp, the video follows an animated Glover walking through suburban neighborhood streets, passing cartoon cameos of Drake, Future, the Weeknd, Kanye West, Nicki Minaj, Travis Scott, Solange, 21 Savage, ASAP Rocky, and more. Kanye is depicted crying while wearing a “Make America Great Again” hat, with an animated Michelle Obama attempting to comfort him. According to Atlanta music supervisor Fam Rothstein, the video features illustration and character design from Justin Richburg. Check it out below.